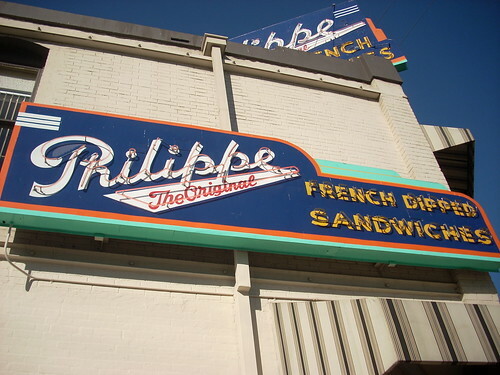 Philippe The Original's iconic neon sign. Home of the French dip sandwich and the nine cent cup of Yuban. Photo by LA Wad via Flickr. After considering San Gabriel and Monterey Park, Gold decided on downtown L.A. as the best place in L.A. for finding great food without a car. Gold cites a list of hip new downtown restaurants plus the ethnic dining standby’s in Little Tokyo and Chinatown – all within walking distance of each other – as good reasons to choose the city center. Also: the transit connections in downtown can take car-free denizens to other culinary destinations in L.A. with ease. Read his entire response on the L.A. Weekly website. Of course, we can’t talk about car-free food without bringing up the Go Metro Dining Map. Our little map full of dining suggestions from Metro riders has grown from nothing to a list of 64 transit accessible restaurants around town. The dining map currently has eight recommendations in downtown – not quite representative of the diner’s paradise worthy of a J. Gold seal of approval. So here’s our next dining map challenge: share your suggestions for downtown dining so we can confirm Gold made the right decision. Leave us a comment, shoot us an email or fill out this form. Remember, tell us what you love about the place and include the address and website and a price range (cheap, moderate, pricey). How could Jonathan even considering San Gabriel and Monterey Park as candidate in the first place. You need cars to go to most places Montery Park. My friend’s mom lives in Chinatown for 3 decades for only one reason : little bit better public transportation in Chinatown (that was before Goldline). With my friend’s insistence, she eventually moved to Monterey Park. Of course, my friend has to give her rider everyday. San Gabriel and Monterey Park are terrible in public transportation (WLA people should live there to know the pain). I might be biased since I live here, but the Hollywood and Highland Metro stop not only has the variety but also dining around the clock. Downtown LA has at least three 24/7 eating establishments–The Original Pantry, The Restaurant at the Standard Hotel, and IHOP.